A year ago I deactivated my Pinterest account. I thought it was making me unproductive, incapable of living in the moment. I was convinced that taking a year-long break would allow me to see the vapid uselessness of the site and become a stronger person. It's been a year since I pinned a photo. A year since I liked a pin. A year since I followed someone else's board. I've spent a year away from my network's pins: cat pics, cool arts, beautiful fashions, inspirational quotes, and photographs of food. Three months in, I started gravitating to other curating services: Tumblr, we heart it, MLKSHK, et cetera. But it just wasn't the same. 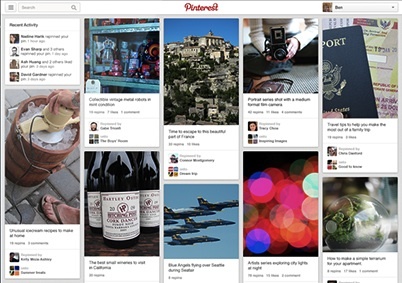 It didn't occur to me until later how integral the central metaphor of a pinboard is to Pinterest's success. With the other services you feel like you're just throwing content into a black hole, but with Pinterest you feel like you're completing something, filling up your virtual pinboard. Sure, the likes and faves were nice. But nothing can compare to the experience of being repinned. The knowledge that one of your pins has made an emotional connection with a fellow pinner, a divine fleeting moment of shared curation in this crazy mixed up world of ours... that simply cannot be replicated by lesser services. I felt like a cave man. I grew despondent. I started making my own physical pinboards, with photos cut out from magazines. I felt like a cave man. The community was gone. Without an audience, who cares? I tried to show my other man friends my boards, but they didn't seem interested. Repinning in the physical realm is impossible. It was then I realized: pinning isn't an individual pursuit, it's something we do with each other. Pinterest is where the people are. Today, my year is up. I type "pinterest.com" in the address bar for the first time in 52 weeks. Apparently they redesigned the site during my absence. Everything looks somewhat familiar yet somewhat different at the same time. I guess it's true what they say: you can't go home again. But I can try. I tried to reactivate my Pinterest account. It turns out you can't actually deactivate a Pinterest account, so I had to register a new one. All my old pins, my old boards, the people I was following... they're all gone now. No matter. I can start over again. May 2, 2013: a new beginning.